The European Commission (EC) announced out of Brussels, Belgium, today that it has moved to take concrete, historic action against Belize and two other countries: Cambodia and Guinea-Conakry, for alleged illegal fishing, by imposing new trade sanctions against them – this on the claim that these three countries have been “acting insufficiently against illegal fishing” on the high seas. It is the first time that such measures are being adopted at this level of the EU—an economic and political partnership between 28 European countries, including Austria, France, Germany, Italy, the Netherlands, Spain and the United Kingdom. “Today’s decision by the Council means that fisheries products caught by vessels flying these countries’ flags are now banned from being imported into the EU,” it said. The news apparently caught Belize by surprise. “I can’t believe it,” Gian Gandhi, Director General at International Financial Services Commission of Belize, told Amandala. Gandhi said that the blacklisting of Belize is “most unfair,” and that the European Union (EU) has totally disregarded Belize’s efforts to address concerns over Illegal, Unregulated and Unreported (IUU) fishing on the high seas. He said that the Commission must have been dealing with old information, because Belize has done everything it needed to do over the last three months, since the EC threatened the sanctions back in November 2013. Belize’s Embassy in Brussels notified the Government of Belize of the news this morning, but Belize has yet to receive any official correspondence from the EU, Gandhi said. Gandhi said that the trade sanction only affects the high seas fisheries, and the ships, now banned by the EU, would now have to unload their fish at other ports or seek registration in other jurisdictions. He told us that two EU officials, who visited Belize last month, got the highest level of political commitment from Prime Minister and Minister of Finance Dean Barrow that Belize was implementing the recommended changes. At this morning’s Special Sitting of the National Assembly, right before the kickoff of the national budget debate, Prime Minister Barrow tabled two statutory instruments: the High Seas Fishing Sanctions (2014) — SI #32 of 2014 and the High Seas Fishing Licensing Regulations (2014) – SI #33 of 2014, which Gandhi said both came into force March 12. Gandhi said that the EU’s reps both in Jamaica and Europe were immediately advised of the legislative changes Belize has made –well in advance of today’s blacklisting. The press release did not say specifically why Belize was blacklisted and made no mention of the legislative changes Belize has made in the past months. Ghandi said that there must have been some “disconnect,” because the EC had said that they were happy with the legislative changes Belize was making. 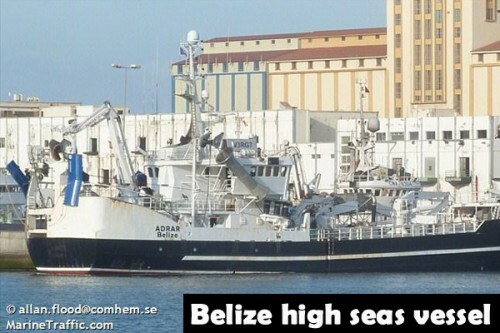 Belize, he said, went further to enter into an agreement with Capricorn Fisheries Monitoring for a US$200,000 program which would ensure that observers are assigned to the high seas vessels as of April 1. It added that after several warnings, the Commission, therefore, proposed to the Council to list the three countries as non-cooperating countries, in line with the EU IUU Regulation. The original press release can be seen here: http://europa.eu/rapid/press-release_IP-14-304_en.htm.